In this irresistible musical, the legendary dancing duo Fred Astaire and Ginger Rogers are at the pinnacle of their art as a feckless gambler and the shrewd dancing instructor in whom he more than meets his match. 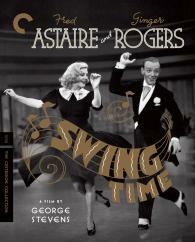 Director George Stevens laces their romance with humor and clears the floor for the movie’s showstopping dance scenes, in which Astaire and Rogers take seemingly effortless flight in a virtuosic fusion of ballroom and tap styles. Buoyed by beloved songs by Dorothy Fields and Jerome Kern—including the Oscar-winning classic “The Way You Look Tonight”—Swing Time is an exuberant celebration of its stars’ chemistry, grace, and sheer joy in the act of performance.